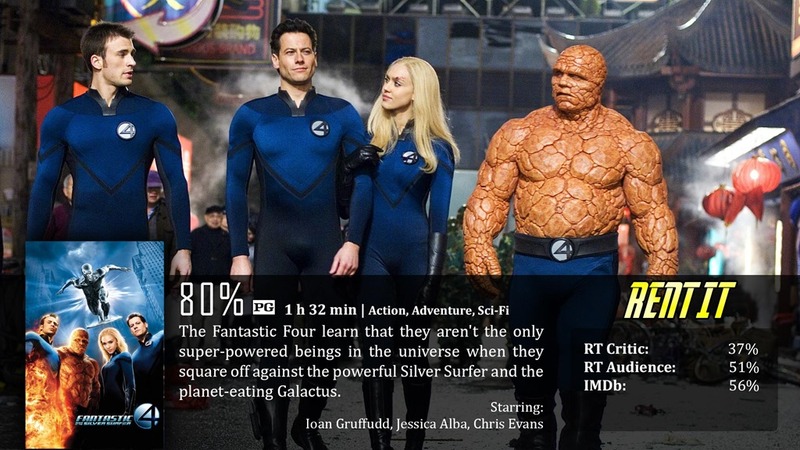 Is it just me, or did I have the main assumption all of these years that everyone hated the second Fantastic 4 movie? I knew that no one was ever really a fan of the franchise as a whole, but I could have sworn the worst one was always thought to be this one, and yet…I couldn’t help but like it more – and then I notice Rotten Tomatoes agrees with me…even if only by slightly…and slightly makes sense. As far as tone goes, this movie feels so much like the original that it could literally be what comes after intermission…literally the very next scene. As far as plot goes, we have something a little more solid. Reed Richards is getting married to Sue Storm, but as luck would have it…the marriage may have to be delayed, because out of the vastness of space appears the Silver Surfer – and he’s there for one mission – to ready the planet for destruction. When Johnny Storm comes into contact with the Surfer, his entire biology is warped to the point that everyone on his team that touches him swaps powers. They have to learn a way to stop this alien and ultimately, the destruction of earth! So for the most part, these two movies are practically the same in both tone and quality. The sequel feels so similar because the plot itself leads directly after the first film – the marriage. However, there are a few reasons I consider this movie better. First of all, even by slightly, the movie definitely had better effects as well as how they are used and how often. Second of all, since we’re done with character development, they were able to get to the action and the plot a lot quicker, which brings me to the plot itself. This is definitely more solid, as we have a real goal-oriented plot between the good guys and the bad guys. Not only that, but the Silver Surfer is so cool. I loved learning about him as a kid, and it was legendary to see him on the big screen. It was still as goofy as the first in terms of how the characters are represented, but at the same time, the Silver Surfer’s existence mellows things down a bit – to be a little darker. There’s actually more violence in this than I thought there would be, given the demotion from PG-13 to just PG. I don’t think there’s any blood, but there is action, violence, and even some sexual innuendo that you most certainly never see from modern PG films…so I was actually impressed with the MPAA rating. For the most part, Fantastic 4: Rise of the Silver Surfer is the same exact type of thing and practically a continuation of the first movie. So if there are things you definitely wanted changed about Fantastic Four, don’t expect to really see any of those changes here. Instead, expect to find a solid plot with better action and better quality visual effects, as well as the overall usage of camerawork and visuals. Everything that I actually considered bad about the first movie was more or less still present here. The acting was still a bit mediocre, the overall tone is still a little too goofy, and The Thing’s costume still looks more like a costume than actual rock. At the same time, they fixed problems with character development and story progression. Originally, Nick Fury was going to be in this film, but he was written out of the script and replaced with General Hager. You are far more generous to these movies than I. They’re both steaming piles as far as I’m concerned. I think the first is slightly better but that’s like calling it the slightly less smelly turd. Sorry, I’m being a bitter comic book fan right now. What this franchise did to its source is criminal. I personally never read the comics, so I couldn’t give two craps about any and all changes, I just look at it as a movie on its own. I love creative freedom, and I welcome changes anyways.